The Kurtz Corner: Animal Head Menagerie + Win A $250 Home Depot Gift Card! Animal Head Menagerie + Win A $250 Home Depot Gift Card! This past weekend, I tackled a fun, but messy, project which I had seen on Pinterest and wanted to try! 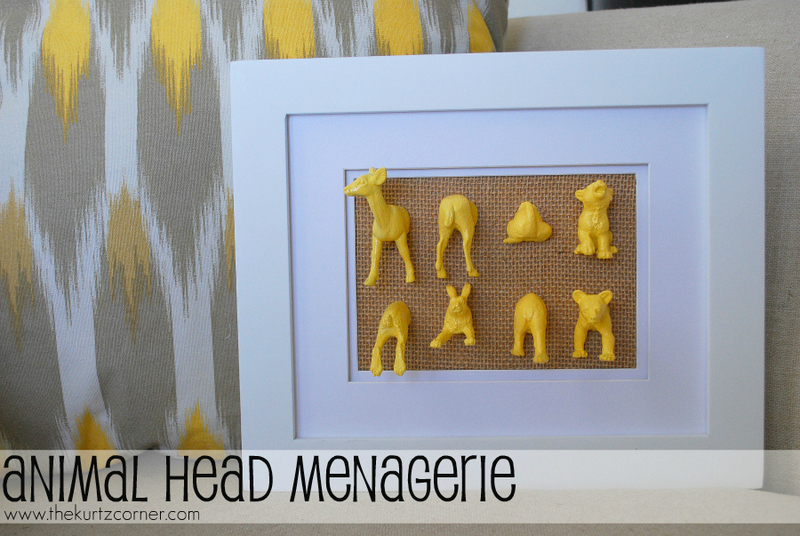 This animal head menagerie is relatively cheap, easy to make, and a super cute accent piece for anywhere in your home! Recently, I was contacted by my friends at P&G and The Home Depot asking if I'd be interested in doing a messy project for them and showcasing the fabulous Bounty Paper Towels in action. You know I'm always up for a messy project and the cherry on top is I get to give away a $250 Home Depot gift card and two rolls of Bounty Paper Towels to one of my lucky readers! The single hardest part of this project is cutting these plastic suckers in half! I really didn't think it would be that hard, but I was wrong. Don't get me wrong, it is do-able, but it takes some patience and lots of upper body strength. Do not, I repeat, do not use a miter saw to try and cut these guys in half, haha! I had my husband try it on two of them. The first one worked okay, but scared the bejesus out of me! The second one's head shot across the garage and came out super jagged! Oops. You live and you learn. So, the easiest method is to take a cutting board, lay the animal on the cutting board, and with a large sharp knife (I'm talking cleaver here), cut through the animal. I laid a kitchen towel over the top of the knife and slowly rocked it back and forth, pressing very firmly on the animal. It will take a few minutes, just keep pressing down and rocking the knife till it goes smoothly all the way through. Be sure to keep your fingers out of the way of the blade! Whew! Okay, the hard part is over! Next comes the painting. For my #BountyChallenge, I used my Bounty paper towels to prevent the spray paint from getting on my backyard patio. 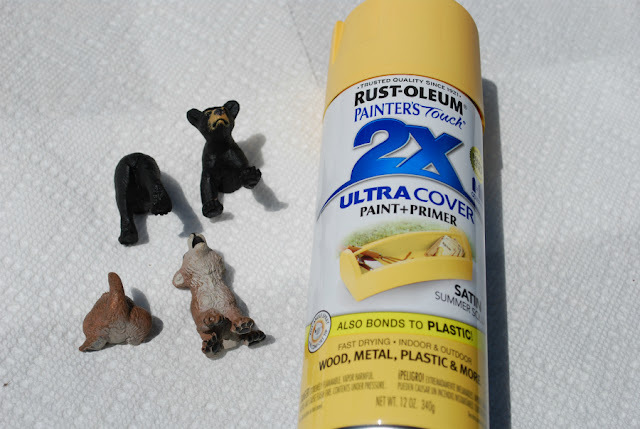 Simply lay out a few sheets of the paper towels and place your animal pieces on the towels, as seen below. Be sure to give short, even sprays of the spray paint and don't get too close while spraying. Allow your animals to fully dry and add any additional coats as needed. These paper towels rocked! Clean up was so easy because none of the spray paint leaked through the towels on to the concrete! That was even after two really thick coats of paint. Not a drop was left on the concrete thanks to my Bounty paper towels. And if you're skeptical about their strength just watch this video! Once your animals have dried completely, take your frame and remove the glass. Attach the burlap to the back of the frame matte using hot glue and stretching it taut and replace the frame backing. Flip the frame over and arrange your animals. Pay attention to the order you put them and don't be a goof like me and mess it up. If you didn't notice I did head, tail, tail, head on the top row and then tail, head, tail, head on the bottom row, whoopsie! That's what I get for rushing! I'm sure I could just pull it off and re-glue it, but I don't mind. That's all, folks! Pretty easy, right? All in all, this project cost me about $20 for the frame, animals, and spray paint. Now, who wants to take the #BountyChallenge and win a $250 Home Depot gift card + 2 rolls of Bounty Paper Towels!? You can enter below for your chance to win, good luck and don't be afraid to get messy! This is a sponsored post by P&G and The Home Depot. I was compensated for this post. All opinions are my own. I want to organize our garage. I'm currently renovating my daughter's closet!-yay for organization! I want to tackle finishing our basement and making it into a playroom/computer room. I want to organize our basement which is one big L-shaped mixed-up office/exercise/play area right now. I want to paint and re-upholster a chair. I really need to clean the patio! I'm wanting to tackle cleaning out my garage and re-painting the floor!! Repainting the bathroom, the color is too dark, needs to be lighter and brighter. I definitely need to tackle the garage! 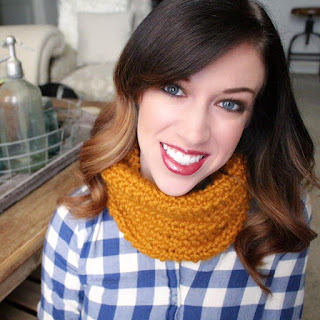 I want to work on some craft projects! I want to tackle the basement and get everything organized! We are getting ready to move into our very first house so we will be tackling all kinds of messy projects from painting walls, refinishing exisiting wood furniture and fun DIY decor projects! I am trying to get my guest bedroom in order so I am painting and need to make some cute artsy things for the decor! I want to tackle painting my sons bedroom. We need to paint our bathrooms! I want to take all the old wallpaper down from our bathroom. We are going to be doing a D-I-Y remodel of our bathroom, which is going to be very messy. I want to redo our bathroom. Its very old and outdated. We need to renovate one of our bathrooms! The tub surround needs to be replaced and in our other bathroom, there's carpet. Ick, shudder! One messy project I need to tackle is patching up holes in our wall made from anchors that previous owners had and then repainting. I would love to redo an old dresser. 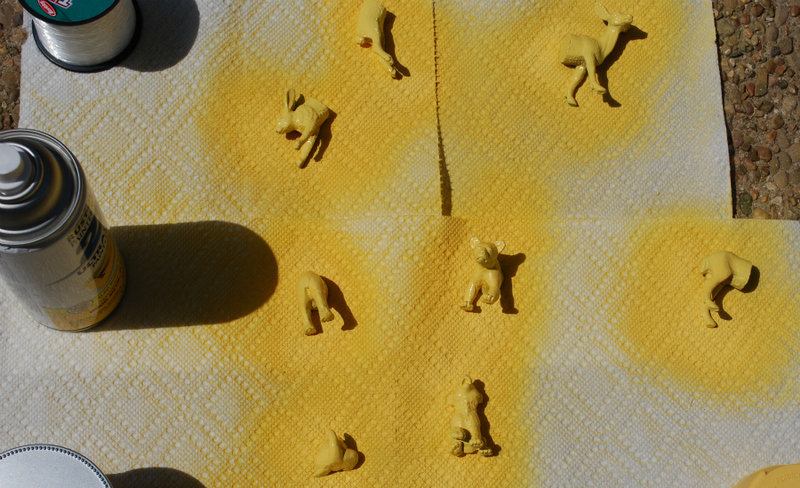 I make a lot of projects involving spray paint, and they all get pretty messy! I would love to tackle repainting the bathroom and removing the old wallpaper! We are building an outdoor pizza oven...it is going to very hot and messy! I'm going to need all the help I can get. I have my great grandmother rocking chair that I want to strip then re-stain and recover the cushion. Right now I'm actually using Bounty paper towels for some PB inspired Mercury Glass Lamps I'm painting.... hopefully soon I'll have a TON of messy projects in the work as long as the bank accepts our offer on a foreclosure-- it's my dream home!! I'd like to paint the basement and clean the garage. Need to repaint the inside of the house. OH my gosh this is adorable! Love it! I just moved to an apartment with a kitchen that needs help. I could use the paper towels to help me clean the walls. The garage, and the patio! I want to make another pallet garden. I would like to reface my kitchen cabinets. Strip and refinish an antique table. refrigerator that has turned into a science project! 1. The attic closets. They have been a catch-all for one month too many! Time to sort, clean, paint anew. 2. Spray painting plastic patio furniture vibrant colors. 3. Installing a new bathroom vanity. 4. Building shelving for the basement music room. 5. Laying down flooring on the back porch. 6. Doing a striped front door paint job. Shall I go on? I could! There's a dozen messy jobs to spruce up our cute 1930's house! I'm going to attempt to do paper bag flooring in my basement in the next couple of months. I'm excited but nervous! I'm going to be making my daughters baptism favors . lots of painting and glueing !! There is an awesome geometric wall pattern project I've been wanting to do. great giveaway...thanks for the advice. I love the animal head menagerie that you made!! Super cute!! I am actually in the middle of a messy project right now. I am painting a kitchen table and chairs for my daughter's new apartment. The table is black with the table top done in a black glaze. The chairs are a peacock blue. It's turning out to be sooooo cute! This is adorable! Super cute. My next project is turning my builder white kitchen and living room into a Tuscan inspired living space. Lots of paint and probably lots of mess! I need to restain the front of the house! I want to removed old wallpaper and paint my kitchen. Thanks for the chance to win!